to complement your home decor. Stitched with 7-Count Plastic Canvas and 4-Ply yarn. 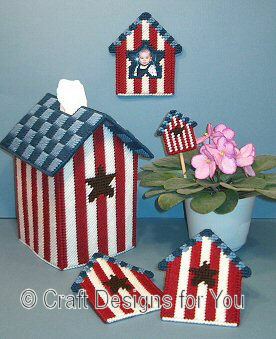 Tissue Box cover is 8" high x 4-3/4" wide. Coasters and Frame are 4-1/4" wide x 5" high. Plant Poke and Magnet are 2-1/4" wide x 2-1/2" high. Pattern includes colored picture of models and instructions to make Tissue Box Cover, Coasters, Photo Frame, Plant Poke and Magnet.